Sensitive teeth? Get rid of this problem! Dental sensitivity is a common problem among people of all kinds. This occurs when you eat hot, cold, sweet or sour food. Acute pain can be short or long and can be caused by various factors. 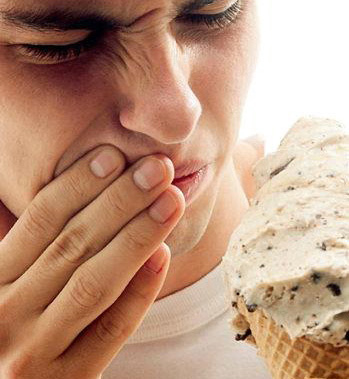 Tooth sensitivity can occur at a single tooth or more. Among the causes of tooth sensitivity include: tooth decay, fillings, gingivitis, brushing improperly, scaling, excessive consumption of acidic foods, dental infections, periodontitis, and so on. The exact cause of tooth sensitivity can be discovered only by an elaborate check at your doctor dentist. Use a toothpaste specially designed for sensitive teeth – you will find a wide variety of toothpaste for this problem on the market. Some of this pastes have, among the main ingredients, potassium nitrate. This important ingredient helps to block the tiny tubules in the dentin. But this toothpaste to take effect, you should use it regularly, not only for a short time! You should also change your toothbrush with soft one specially designed for sensitive teeth. Moreover, you would have to change the way you brush your teeth, because hard brushing can increase dental sensitivity. To stay away from dental problems you have to gently brush your teeth twice a day, at least for two minutes. You should not forget about the rules of good dental hygiene, such as brushing at least twice a day, use mouthwash and dental floss adapted for your problem and regular visits to the dentist. The gums are very important in dental sensitivines. Gums recession can be caused by gum disease or hard brushing. To restore your receding gums, you should make a visit to your dentist. If you’re one of those people who clench their teeth you should quit this habit, so dangerous for your health dentistry. If this usually occurs at night, when you sleep, use a mouth guard or change your sleeping position. You should limit the consumption of acid or high sugar content food and drinks! These foods constantly attack your tooth enamel, and, in time, they will become more sensitive, if not avoid acidic food or too much sugar. There are ways you can get rid of tooth sensitivity that can be achieved at dental doctor’s office and at home. These include fluoridation, tooth brushing with a desensitising toothpaste, mouth gourds, and dental scaling annually. If you want to get rid once and for all dental sensitivity turn to a dentist who find the exact cause of your problem and treat it properly!